Don’t Like Iced Tea? How About Juice for $0.03!? I would have combined posts, had i not seen this one 5 seconds after the Iced Tea post was completed. Anyway, go here to print the $0.55/1 coupon there. Take it to Wal Mart and find the 10 oz. 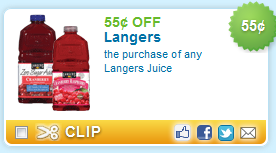 small Langers juices for $0.58 each. Bam! $0.03 juice!